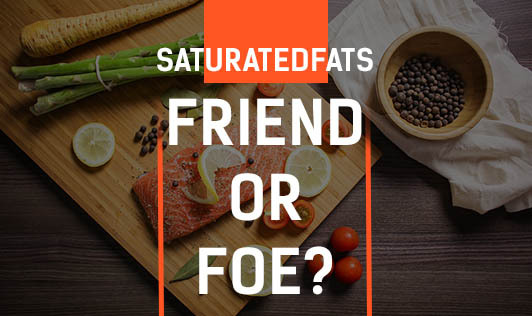 Saturated Fats – Friend Or Foe? Saturated fats are found in animal foods that include beef, lamb, pork, lard, poultry fat, milk, butter, cheese and other dairy products. All of these foods also contain dietary cholesterol. Foods from plants include coconut, coconut oil, palm oil etc. We only know the dark side about saturated fats. It is known to increase LDL levels, triglycerides and cholesterol levels and hence, we try to avoid them from our food completely and depend on only unsaturated fats for cooking. Let's see how saturated fats can also be friendly! Whatever be the fat you eat, everything should be in moderation and that is the key to your good health! A study from Harvard medical school, states that "Saturated fat is not so bad for you and that you can replace it with anything to get their benefit." Replacing saturated fats with other types of fats, such as monounsaturated fats found in plant sources, did not appear to influence disease progression, but replacing fats with highly refined carbohydrates did. Higher carbohydrate intake was associated with more disease progression. Besides being heart friendly, saturated fats contain specialized fatty acids which are naturally antifungal, antimicrobial and antiviral, and are known to improve immune health and prevent illness. Coconut oil, being a Medium Chain Triglyceride is used in the treatment of Attention Deficit Hyperactive Disorder, epilepsy, dementia, digestive disorders etc. 1. Reduce the percentage of overall calories in your diet, specifically from saturated fat. 2. Reduce the intake of junk food, which is the leading factor for heart ailments and other lifestyle diseases. 3. Swap full fat dairy foods with reduced, low or no fat dairy produce for all family members more than two years old. 4. Go for lean cuts of meat and poultry to derive essential nutrients. Always compare the nutrition information panel on the back of every product, and choose the one with the least amount of saturated fats.